I had some leftover cauliflower that I needed to use yesterday as well as a brand-new bag of organic yellow squash, so I put together this dish for lunch. 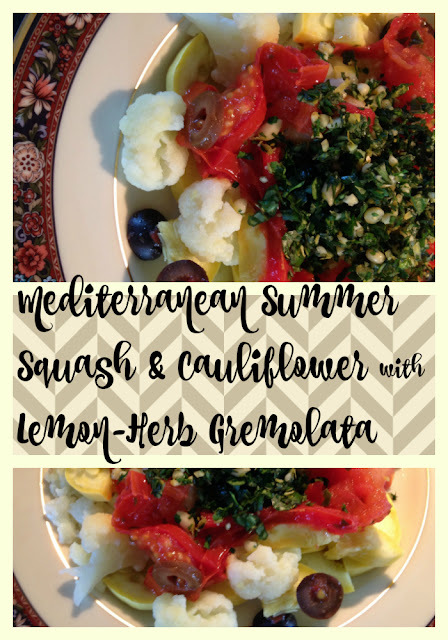 I'm growing Greek oregano, parsley, basil, and thyme in my front yard container garden, so I chopped up a fresh Lemon-Herb Gremolata to sprinkle over the top, and it was scrumptious. I sat down and ate two whole plates of it, and with the fats from the oil, olives, and pine nuts, it was more filling than you'd expect from just eating a plate of steamed/sauteed veggies. Heat olive oil in skillet and add sliced tomato and dried or fresh herbs. Sauté for a couple of minutes, then lid it to get the tomatoes to break up and soak up the oil and herbs. Cook for about 7-10 minutes, to desired level of sauciness. Toss in the black olives at the end to heat through. Layer a huge pile of steamed squash and cauliflower, then scrape tomatoes and olives on top. Sprinkle with a little salt and some fresh ground pepper if desired, then top with gremolata, below. Put all ingredients together in a pile on your cutting board and chop fine.